Tete de moine is pale yellow in color and matured for 3-4 months. 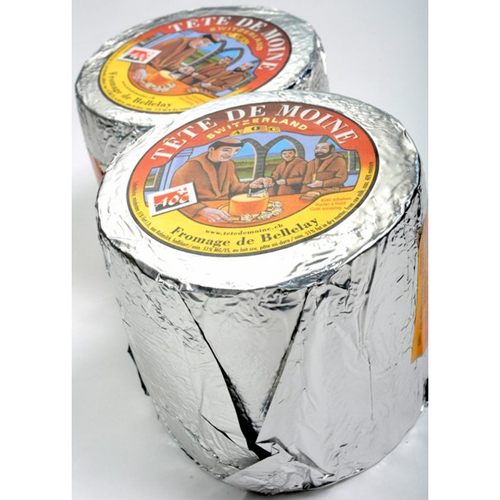 This cheese is excellent with fresh or dried fruit and a nice full bodied red wine. Sold as a whole wheel only. 2# wheel. Upon receipt of your order the ice pack may no longer be frozen. This is expected and should not be the cause of alarm. The cheese should be cool to room temperature. Once rewrapped and stored properly the cheese will last up to 3 weeks. For optimal storage allowing the cheese to breathe and retain moisture wrap the cheese in wax paper, plastic wrap or tin foil upon arrival. A - Bloomy rind, tomes, hard or dry rind cheeses - wrap only the cut surface in plastic wrap, leaving the rind exposed so the cheese can breathe. B - Blue cheeses should be wrapped securely in tin foil. C - Washed rind cheeses should be wrapped in wax paper. D - Small cheeses such as goat’s milk crottin should be wrapped in wax paper. E - Soft cheeses store well in waxed paper or sealed containers. Store your cheese in a cool, damp place such as a wine cellar, larder, wine cabinet, or in the vegetable drawer of your refrigerator (the warmest part of the refrigerator). As a general rule, aged hard cheeses last longer than softer, less aged varieties. For the fullest flavor it is recommended to bring cheese to room temperature before serving. To ensure product quality all cheese will ship overnight May 1 through October 1 due to warm summer temperatures. October through May all cheese will ship 2nd Day, with an Overnight option available at an additional charge.